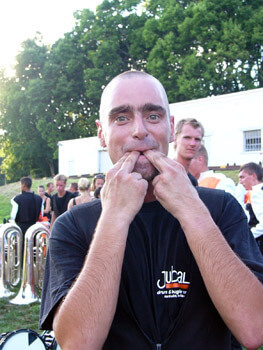 Vincent Brinkhof, a 28-year-old from Dordrecht, Netherlands, has a unique solo in Jubal's 2006 program. Rather than blowing a mellow solo on the baritone which is his primary instrument, Brinkhof relies on the shrill sound of a two-finger whistle to get the job done. Jubal will perform as part of the Division II & III Prelims today at the 2006 DCI World Championships.